In-slab heating is the most popular choice for full home heating; here the cables are fixed to the reinforcing steel just before the slab is poured. 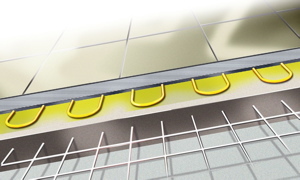 In-slab heating is the ideal solution for connection to off-peak or smart metering. The concrete slab then acts as a heat sink, storing cheap night time electricity and releasing it slowly during the day. With this system you can heat your home 24/7 throughout the winter at a reasonable cost. In-slab heating can be used with most floor coverings, but it is especially popular beneath polished concrete and tiled floors. In-screed heating is the preferred choice for heating most bathrooms. 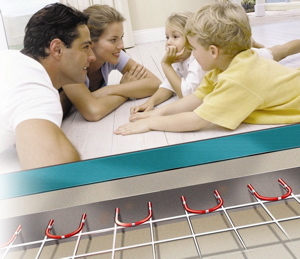 It is a direct acting system and is installed just before the tiler screeds the floor. The cable is the same robust design as the in-slab and it is suitable for installation below any stone or tile surface. Under-tile heating is a popular choice in renovations where floor height is critical, or where no screed is being applied. Under-tile heating is also a direct acting system, warming up quickly so it is suitable for using just a few hours a day or on an ad-hoc basis to suit your requirements. Contact us today for an obligation free quotation, floor heating is not as expensive as you might think!